Who doesn’t love bite sized food? I know I do. There is an added fun factor when food is smaller. These pralines are great for serving at gatherings or for a quick grab and go treat. Line 2 baking sheets with parchment. Stirring gently, bring 2 cups pecans, both sugars, cream, and butter to a boil in a medium heavy saucepan over medium-high heat. Attach candy thermometer to side of pan. Boil, occasionally swirling pan, until thermometer registers 236°, 7–8 minutes. Remove from heat; stir vigorously with a wooden spoon until mixture thickens and pecans are suspended in syrup, 2–3 minutes. Drop candy by heaping teaspoonfuls onto prepared sheets. Let cool completely. Spoon some melted chocolate over; place a pecan half on top. Chill until set, about 30 minutes. Can be made 1 week ahead. Store airtight in refrigerator. Return to room temperature before serving. 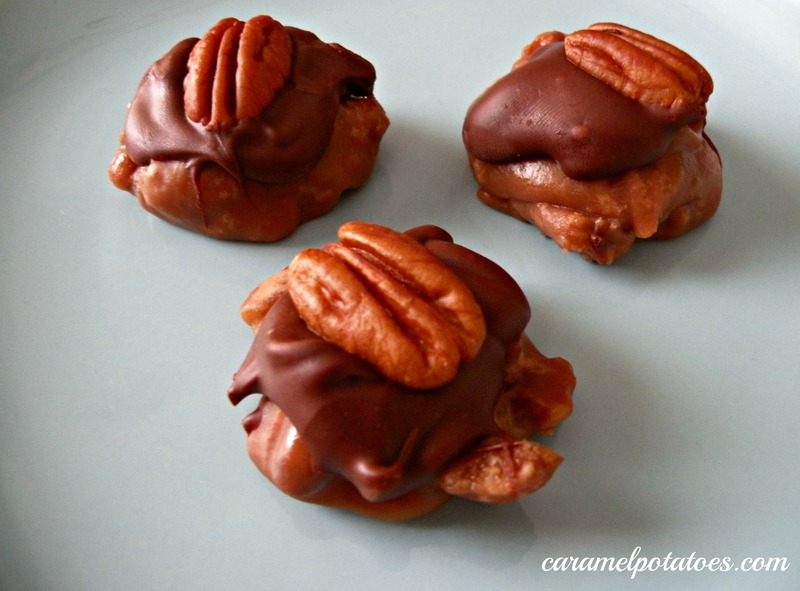 I love anything with pecans-can’t wait to try these!